Yimiton's Blog: Video of Ardi Rizal, 2 year old baby who smoked 40 cigarettes a day. Video of Ardi Rizal, 2 year old baby who smoked 40 cigarettes a day. 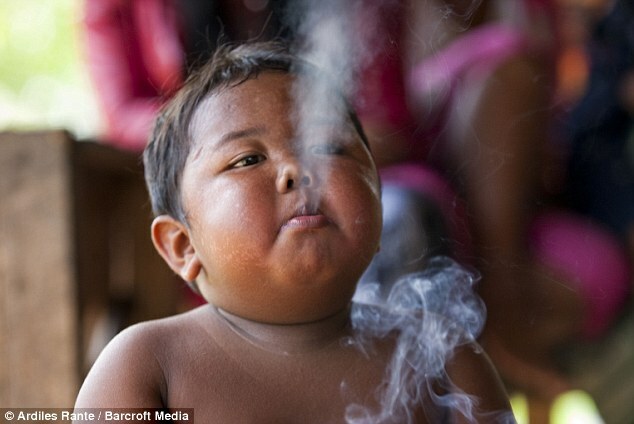 I was watching a documentary recently and was shocked that I'd never heard about Ardi Rizal, a 2 year old boy, (now 6) who smoked packs and packs of cigarettes in a day while his family watch on. I mean, this boy was so young, he still fed from a baby feeding bottle! Fortunately, he is said to have quit after going through a rehab after the video went viral in 2010 and the government of Indonesia felt disgraced. The bad thing though is that the boy is now suffering some kind of chest infection caused by the cigarettes he's been exposed to and had smoked at such a young age. Even though he's said to have quit, his mother said he uses it as a threat. 'If I don't buy him toys, he threatens to start smoking again,' said his mother. Asked if he still smokes, he replies that he will 'never smoke again'. But his mother said she caught him with a cigarette recently because people in town offer them to him when he visits. 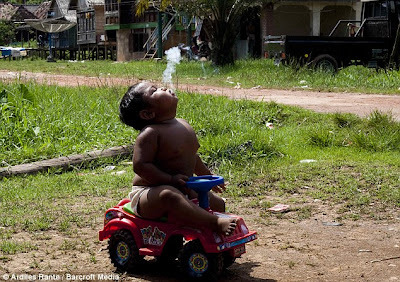 Ironically, Ardi is not the only 'smoking child' in Indonesia. It's quite common to see children as young as him puffing away on cigarettes being lit by their fathers and grand fathers. There was this peculiar case of another smoker aged just two called Chairul, who lives in a fishing village in Eastern Java. He was shown lighting up a cigarette straight after waking up from a nap, with help from his granddad. As Chairul smokes beside him, he said he doesn't think it is a problem. 'He sometimes smokes two packs a day,' he said. Seriously, if you catch your child with a stick of cigarette, how will you react? shame oooooo. Yimi my friend, the great googler has not heard of this kid. Kai!